One of the hardest parts of being a freelancer is finding new clients. And though many professionals may be currently experiencing scope creep and client overload, the task of securing new projects has to be one of the biggest challenges in the world of freelancing – probably because by nature, there are more people seeking freelance work than people looking to manage it. Freelancing marketplaces like Freelancer.com offer some leeway, but as your portfolio gains momentum, those 10% commissions begin to take a toll on your bottom line. And if you have a lack of experience in cold calling, the thought of generating leads by reaching out to companies can be distressing, not to mention ineffective and time-consuming. …even those that are blocked or do not accept applicants from their country of origin. Their secret weapon: A reliable VPN (virtual private network). A VPN is a secure way of accessing freelancing websites without country bans and IP restrictions – a welcome encouragement for any freelancer. Instead of worrying about not being able to browse job listings or send in a proposal, you can focus on crafting attention-grabbing pitches and let your virtual private network take care of the rest. Several kinds of freelancing websites impose IP restrictions and country bans that vary in nature. Below are some examples. HireWriters is a web content platform that was launched by Moniker Online Services LLC since 2012. It allows freelancers to pitch themselves to companies that need ghost writing, blog writing, copy writing, email copy, product descriptions, proofreading, and more. 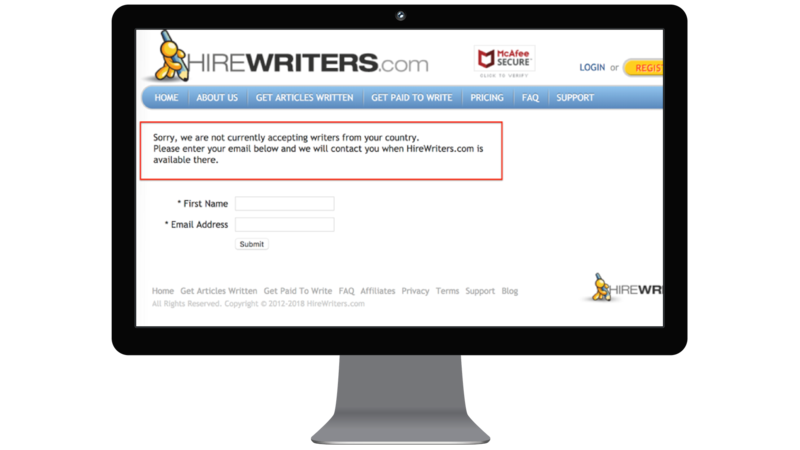 However, HireWriters only accepts people from the United Kingdom, Canada, New Zealand, Australia, Ireland and The United States. It also indicates that its project listings are only accessible to native writers. This can be a setback if you’re a native writer living outside of any of the eligible countries or can match a native writer’s tone, style, and grammar on any given day. 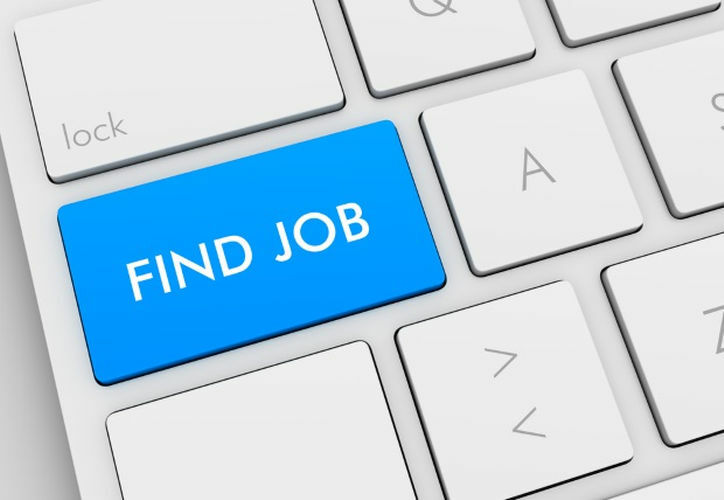 Fortunately, you can use a VPN to connect to a server that’s located in any of the eligible countries and make an account on HireWriters. For example, if you’re based in India, you can connect to a server located in the United States before accessing the site. The connection would also transform your Indian IP address to a US IP address. Upwork accepts freelance applicants over the age of 18 from a multitude of countries, but individuals or businesses in a few nations are not eligible to utilize the platform or register for accounts. Additionally, the company says there may be other nations it does not service at the moment. Interested freelancers in these areas will be unable to make an account. Even if people from these restricted countries manage to register an account – during travel, for instance – Upwork will suspend their account when they log in using an internet service provider from their home country. Once Upwork suspends an account, it does not allow the holder of that account to work on its platform again ever. Aside from imposing direct bans on specific countries, Upwork is known to frequently suspend accounts from non-native English countries like Pakistan, India, Sri Lanka and Bangladesh. 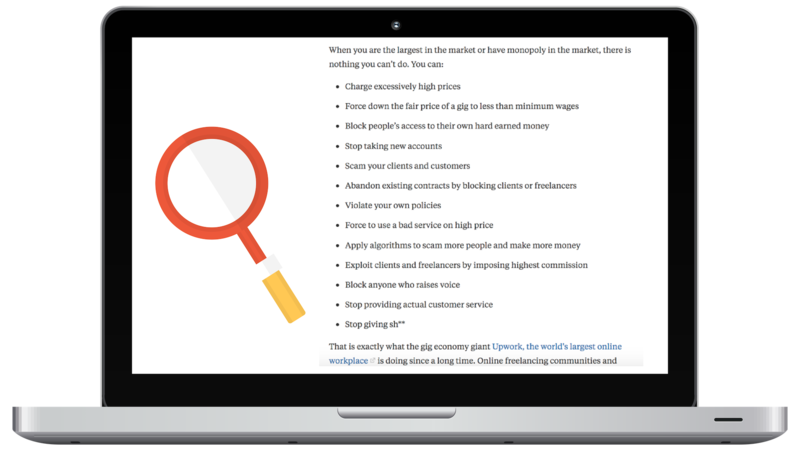 While some freelancers do violate Upwork’s policies, many experience platform restrictions and account bans without a genuine reason. Incredibly, many of these bans and restrictions can be avoided with a virtual private network. Connecting to a VPN server in a native English country should give you access to the full suite of Upwork’s services. Plus, it may also minimize the chances of your account getting suspended just because you’re from a non-native country. 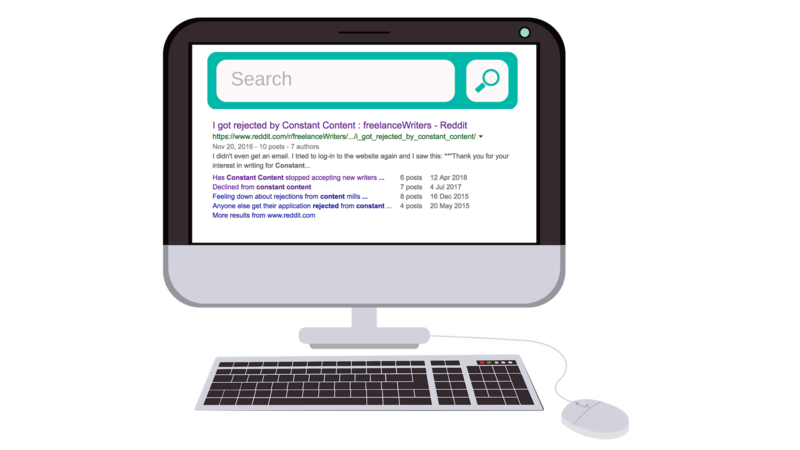 Constant Content provides clients with customized and pre-written web content; it lists hand-edited documents from approved freelancers. Freelance writers, copy writers and editors may find more-steady freelance work on niche websites such as this than on free-to-all websites that cater to applicants from all industries. However, Constant Content mostly accepts freelancers from the US, UK and Europe. Those living in places where English is spoken as a second language, like Southeast Asia, can find it hard (if not impossible) to get approved by Constant Content. For those interested in finding freelance work on Constant Content, a VPN adds an extra layer of protection by switching their IP address to a native English country’s IP. If you can pass the grammar test, submit noteworthy samples, and get other bits and bobs right, there’s a likely chance that your application would be accepted. In addition to offering unrestricted access to freelancing websites, a VPN also goes a long way in protecting your privacy. Reality is, privacy is a big challenge, and your credentials can be easily spoofed when you are using the internet. Anyone from curious people and government organizations, to marketing firms, can easily find your location, address and even bank account number with minimal hassle and you may not know about the theft of our information. A VPN ensures that any information you transfer of the World Wide Web is encrypted. It does that by hiding your personal computer’s/mobile’s location and IP address. This is particularly crucial when using an insecure or public network to keep anonymous from prying eyes. Furthermore, you also get the ability to send anonymous emails and link to other digital properties without a third-party knowing who posted the link. It’s possible to get started with a free VPN, but we strongly recommend against. Free-for-all virtual private networks can keep track of and log all your activity – the exact thing they’re meant to offer a safety net against. Worst of all, many of these free applications can sell your data to third parties, with some going as far as to monetizing your sessions (that’s why those ads pop up all the time). Essentially, industry-leading virtual private networks like SlickVPN are more stable, faster and reliable than their free counterparts. They don’t place limits on the data you’re allowed to use and shield your activity with top-grade encryption. It costs extra, but you get what you pay for. Bypassing restrictions while keeping your privacy intact require a lot of dedication and resources, and reliable VPN providers do just that for a mere $10 or less. More freelance work awaits you!